I hope that your summer has been awesome. I’ve been busy with my boys, gardening, camping and enjoying as much of the Albertan summer as I can. Real Estate in Edmonton tends to take a break as well. You’ll see longer than average DOM for average properties just due to the lack of traffic. Sought after locations and incredibly well priced deals, still go fast. The multi-family market has been slower than usual with less than stellar listings on the MLS/CLS. That’s not to say that sales don’t happen - several, excellent pocket listings have been bought and sold this past month. With the federal election looming just 5 weeks away I’m finding some buyers hesitant to commit to a purchase and some (albeit not many here) sellers anxious to unload if over 60 DOM. What that means if you’re a buyer is that you may be able to wiggle a better purchase price between now and the election results. For seasoned investors the election timing doesn’t play such a big role in making a purchase, other than leveraging a sale. Seasoned investors have a plan in place to operate their property in a down or an up market. There are pros and cons to both and money making opportunities for each. One maddening trend that I am starting to see is inexperienced ‘investors’ getting nervous about filling their vacancies. I’m starting to see ads for reduced rents, security deposits and even ‘1 month free’. This is a poor strategy and one that pulls all investors down. There are many strategies to employ (we list a lot here and in our media section of the website, look for “How To” articles.) that will help you get a better tenant and offer them value without dropping your rents below market value. If you’re having trouble renting a property now, give me a call and I’ll fine tune your ad and give you some tips to help. Smart investors have a good buying season ahead - give me a shout to see what investment properties we have that fit for you. P.S. Want a cool mini-guide to investing in a downturn? We published a terrific booklet back in 2011 titled “3 The Critical Landmines You Need To Avoid When Investing in Real Estate”. I’d like to send it to you. Simply reply back with “3 Critical Landmines” in the subject line and your email and we’ll hit you back with a free copy. Turbo charge your portfolio. This terrific Side by Side duplex features separate (not legal - but potential to legalize) suites down. 1957 built, located on a quiet cul-de-sac, across from school and park. Walking distance to schools and transport. Close to downtown and Wayne Gretzky Drive. 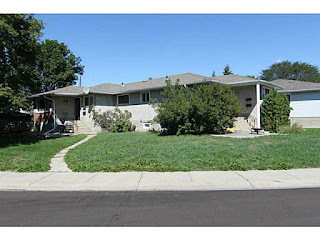 This property has separate entrances to each suite; 2 X 2 bd and 2 X 1 bd, double garage, plus pad. This property was purpose built and is in fair condition. Investment capital includes $30K budget slated for further renovations to modernize, improve value, aesthetics and rentability. This is a turn-key deal. Good access to downtown and in a great, mature neighbourhood. Comes complete with great tenants making this a totally turn-key property for you. Holyrood is a mature neighbourhood that is desirable for tenants working in the south end and downtown. HUGE upside potential due to the great purchase price, strong economic fundamentals and the proximity of this property in relation to Edmonton's desirable growing core. Update on housing - no boom - no bust. While the term "recession" may have applied to some sectors of the Canadian economy in the first half of the year, it certainly does not apply to Canada's housing market. This view is strongly supported by the fact that, after exhibiting back-to-back declines in December of 2014 and January of this year, due in part to the negative impact of low oil prices on Alberta and colder than normal weather on the rest of the country, home sales have trended steadily higher since February.